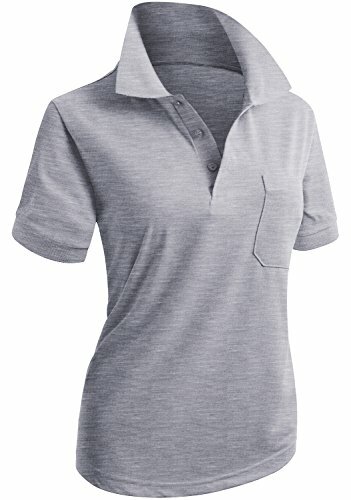 CLOVERY Women's Golf Wear Short Sleeve Polo with Pocket Melange US XXL/Tag XXXL by CLOVERY at Lamont Design. Hurry! Limited time offer. Offer valid only while supplies last. CLOVERY Women's Casual 3-Button Short Sleeve PK POLO Shirts FEEL SUPER COMFY CLOVERY Women's Casual Short Sleeve Pocket Polo Shirts is high quality! CLOVERY Women's Casual Short Sleeve Pocket Polo Shirts is high quality! SUPERIOR QUALITY FABRIC and Soft, comfortable and stylish specializing in the design. This Premium 3-Button Polo Shirt is comfortable to wear. Perfect for the golf, tennis, office wear and casual wear any occasion. This Shirt is made with lightweight and high quality soft material that makes you feeling well for the soft skin. SHORT SLEEVE PREMIUM Casual Pocket POLO Shirts with short sleeves are an essential closet staple. Moreover, the short sleeves are the trend of today and therefore these polo shirts ensure high style quotient while letting you be comfortable. Women's Premium 3-Button Polo Shirt is Comfortable to Wear // This Shirt Wear to any time, Short-sleeve polo shirt featuring three-button placket and chest pocket, high quality. / This fabric is thin, a little see through. Occasion : Sports, Uniform, Casual, Office, Golf, Tennis and more occasion. If you have any questions about this product by CLOVERY, contact us by completing and submitting the form below. If you are looking for a specif part number, please include it with your message. © 2019 - lamont-design.com. All Rights Reserved.